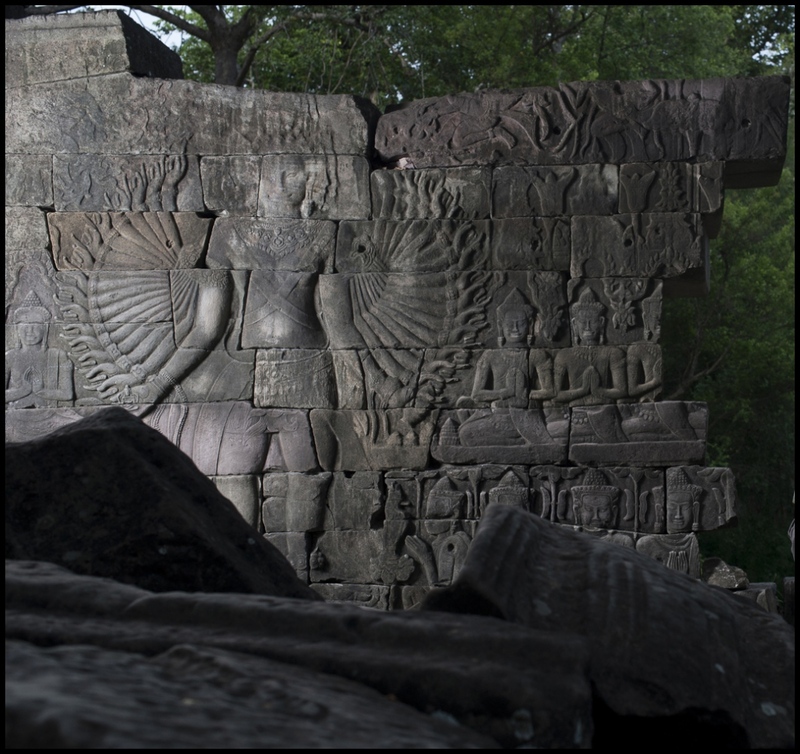 Craig Stennett Photojournalist | The Lost Temple, Banteay Chhmar. Ta Nem Temple at Banteay Chhmar in Cambodia. Built by Khmer King Jayavarman 7th (1181-1219). 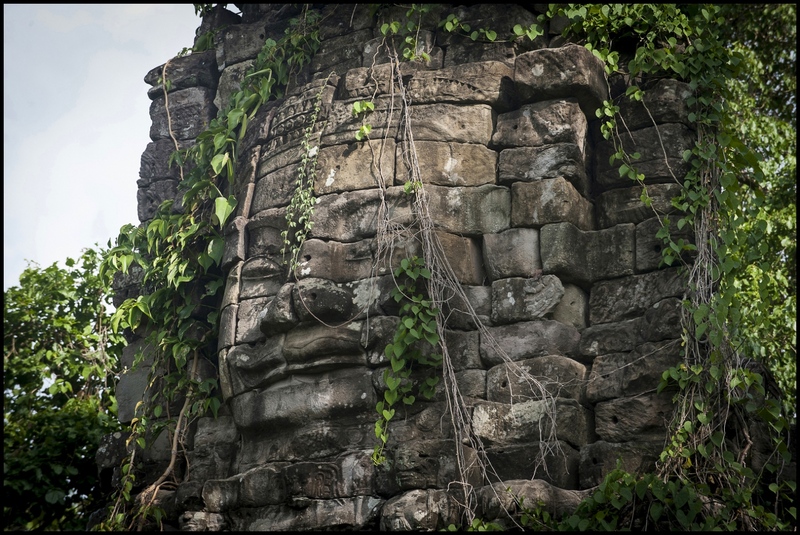 The face towers at Banteay Chhmar are believed to be the prototype for the Bayon situated at Angkor nr Siem Reap,Cambodia. 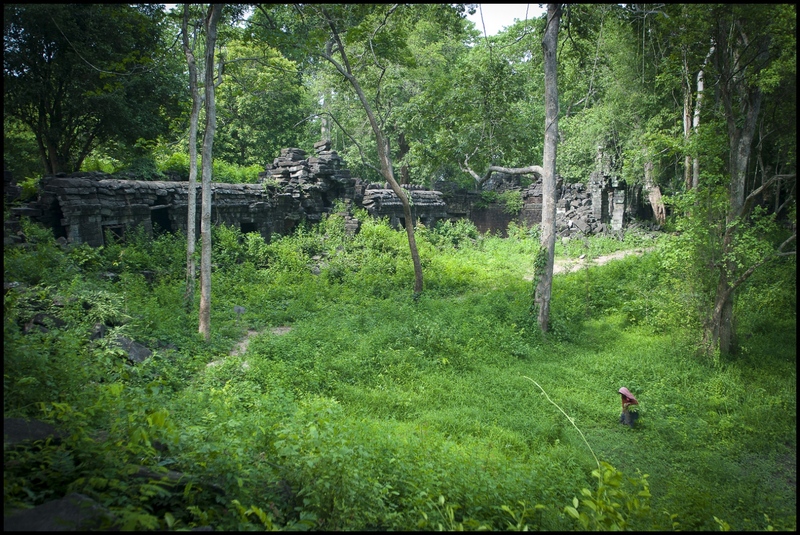 Hidden in the Jungle and still requiring a local guide to find a lone tourist visits Ta Nem Temple at Banteay Chhmar in Cambodia. Built in the 12th century by Khmer King Jayavarman 7th (1181-1219). 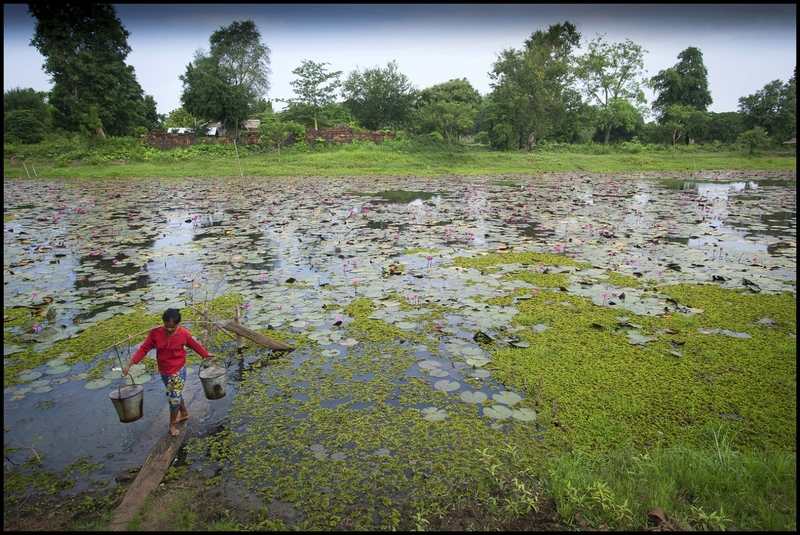 A Khmer woman from Banteay Chhmar collects drinking water from the moat surrounding the 12th century Khmer Temple at Banteay Chhmar. The moat and accompanying 'Baray" (reservoir) constructed in the 12th century was used untill recently for all the local community's water needs. The temple was built by Khmer King Jayavarman 7th (1181-1219). The moat represents in indian mythology the primordial sea and the outer temple wall depicting the mountains that ring the world. The central tower shrine symbolized Mount Neru the home of the gods. In its heyday a population of !00,000 could be supported by the water conservation installations built by the Khmers at Banteay Chhmar. Storing water for irrigation and fish. 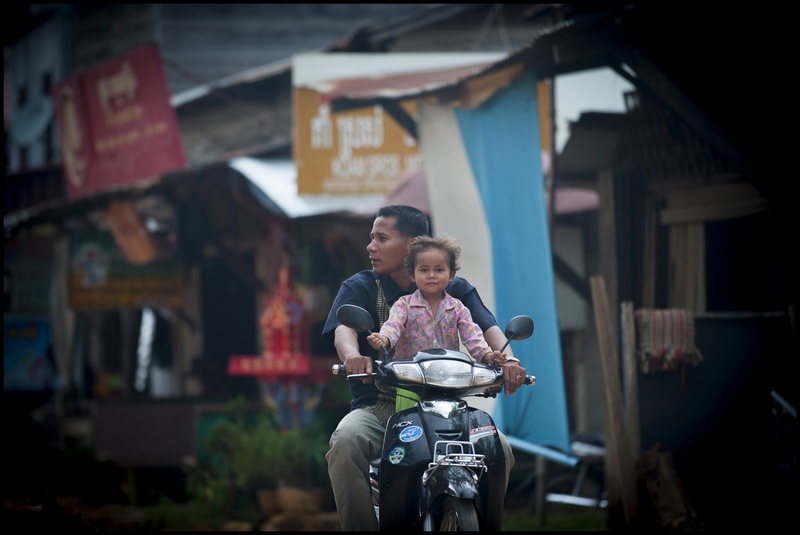 This youngster with her father riding through Banteay Chhmar in Cambodia hopefully will benefit from the temple preservation and UNESCO World Heritage status (if it comes) Plus the tourist income it will bring to the area. 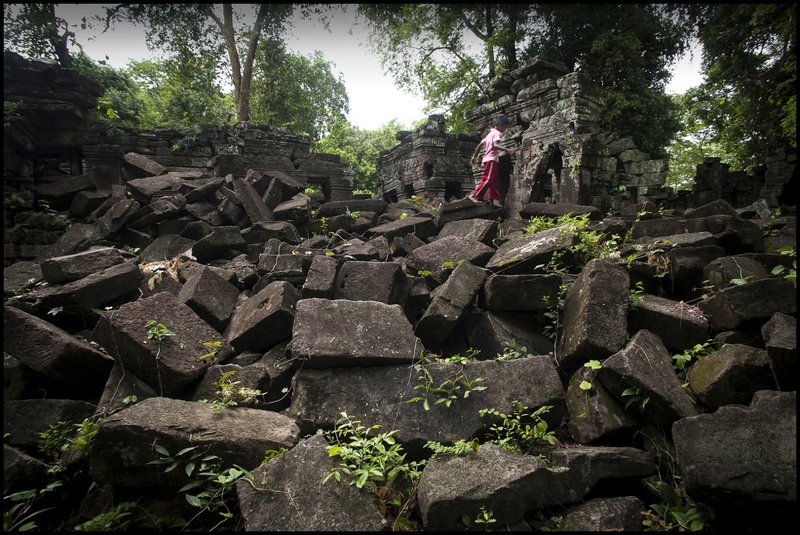 The rainy season brings problems for the Khmer Monastic Complex of Banteay Chhmar temple in Cambodia. It has over time undermined the temples Bas Relief. Photograph on road near temple. The Bas Relief at Banteay Chhmar Temple in Cambodia. Built by Khmer King Jayavarman 7th (1181-1219). The 'God' Avalokiteshvara at Banteay Chhmar Temple in Cambodia. Constructed by the 12th century Khmer King Jayavarman 7th (1181-1219). This carving is unique to Khmer Architecture and is not seen at any other of the Angkor sites in Cambodia. Khmer stone masons at work on the laterite stones at the Banteay Chhmar Temple in Cambodia. Built by Khmer King Jayavarman 7th (1181-1219). They have spent the last 3 years painstakingly dismantling and rebuilding this 20 metre section of the temple ruins at Banteay Chhmar. John Sanday "The Khmer stone masons have an affinity with the stone. They're allways touching it feeling for the accuracy of the join. Banteay Chhmar Temple in Cambodia. Image on the walls believed to be the 12th century Khmer King Jayavarman 7th (1181-1219) who also constructed the temple. Khmer stone mason at Banteay Chhmar Temple in Cambodia. Built by Khmer King Jayavarman 7th (1181-1219). They have spent the last 3 years painstakingly dismantling and rebuilding this 20 metre section of the temple ruins at Banteay Chhmar. John Sanday "The Khmer stone masons have an affinity with the stone. They're allways touching it feeling for the accuracy of the join. Missing heads on the 'Gods & Demons' either looted or lost at Banteay Chhmar Temple in Cambodia. Constructed by the 12th century Khmer King Jayavarman 7th (1181-1219). 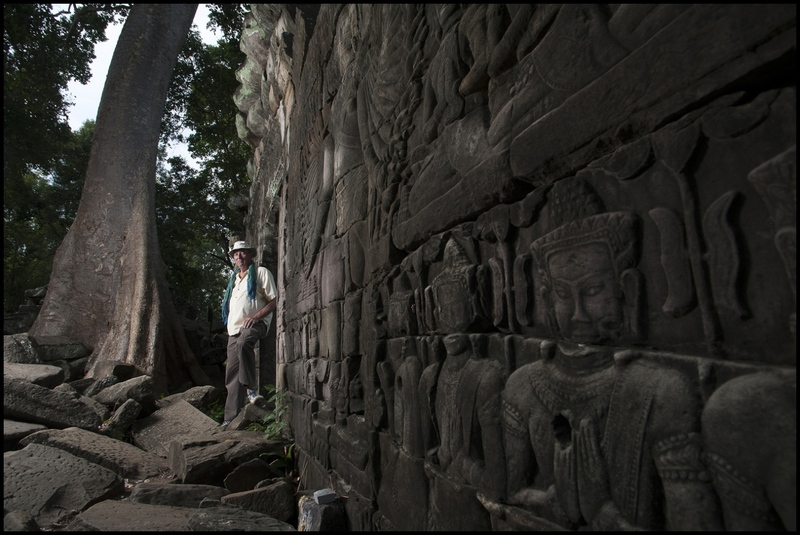 Architect John Sanday (OBE) at Banteay Chhmar Temple in Cambodia. Constructed by the 12th century Khmer King Jayavarman 7th (1181-1219). 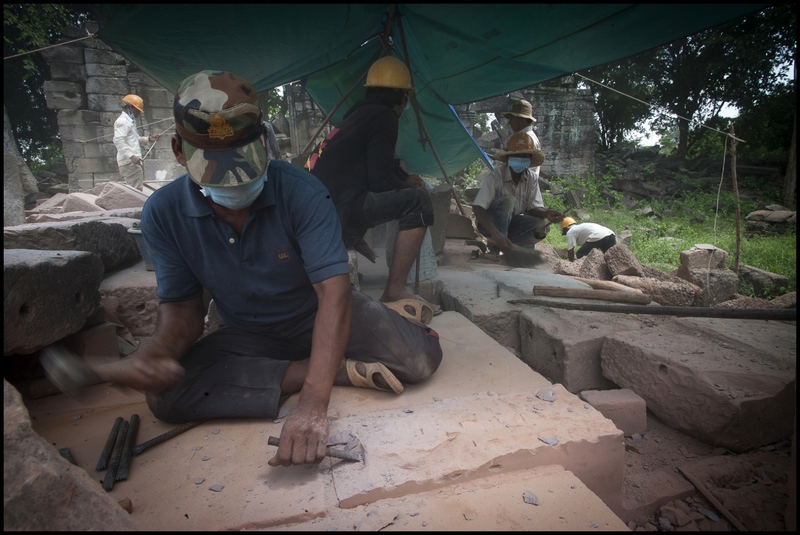 Khmer stone masons working on the stone work to the Banteay Chhmar Temple in Cambodia. Built by Khmer King Jayavarman 7th (1181-1219). They have spent the last 3 years painstakingly dismantling and rebuilding this 20 metre section of the temple ruins at Banteay Chhmar. John Sanday "The Khmer stone masons have an affinity with the stone. They're allways touching it feeling for the accuracy of the join. 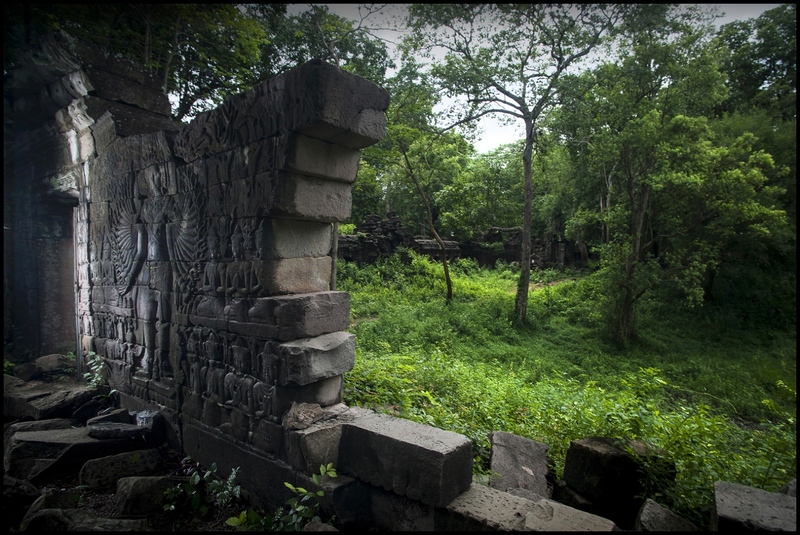 Due to its geographical isolation time,elements and the jungle have encroached on the Banteay Chhmar Temple in Cambodia. Constructed by the 12th century Khmer King Jayavarman 7th (1181-1219). A local woman collecting herbs at the monastic complex at Banteay Chhmar Temple in Cambodia. Constructed by the 12th century Khmer King Jayavarman 7th (1181-1219). Architect John Sanday (OBE) stands beside the image depicting the 'God' Avalokiteshvara at Banteay Chhmar Temple in Cambodia. Constructed by the 12th century Khmer King Jayavarman 7th (1181-1219). The 'God' Avalokiteshvara at Banteay Chhmar Temple in Cambodia. Constructed by the 12th century Khmer King Jayavarman 7th (1181-1219). Architect John Sanday (OBE) discusses progress with Kim Sothin Deputy Director of Department for Safeguarding and Preservation of Cambodian Monuments at Banteay Chhmar Temple in Cambodia. Constructed by the 12th century Khmer King Jayavarman 7th (1181-1219). Khmer stone masons replacing the stone work to the Banteay Chhmar Temple in Cambodia. Built by Khmer King Jayavarman 7th (1181-1219). they have spent the last 3 years painstakingly dismatling and rebuilding this 20 metre section of the temple ruins at Banteay Chhmar. 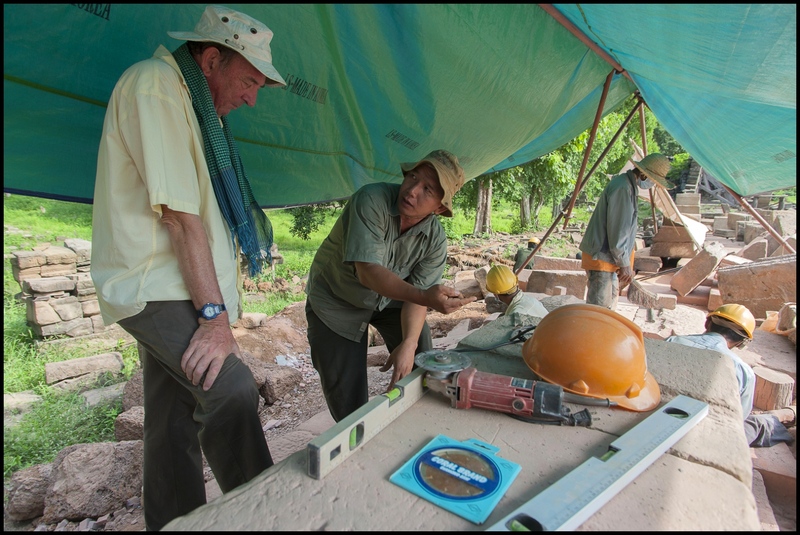 John Sanday "The Khmer stone masons have an affinity with the stone. They're allways touching it feeling for the accuracy of the join. 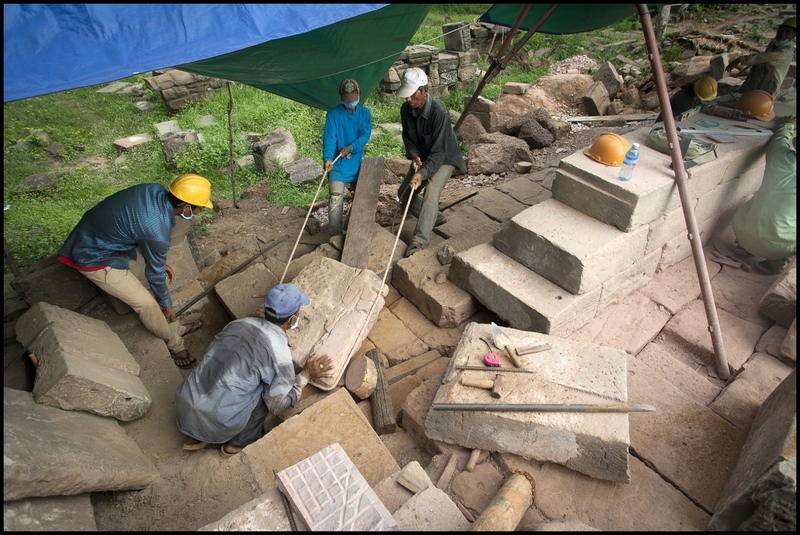 Khmer stone masons replacing the stone work to the Banteay Chhmar Temple in Cambodia. Built by Khmer King Jayavarman 7th (1181-1219). they have spent the last 3 years painstakingly dismatling and rebuilding this 20 metre section of the temple ruins at Banteay Chhmar. 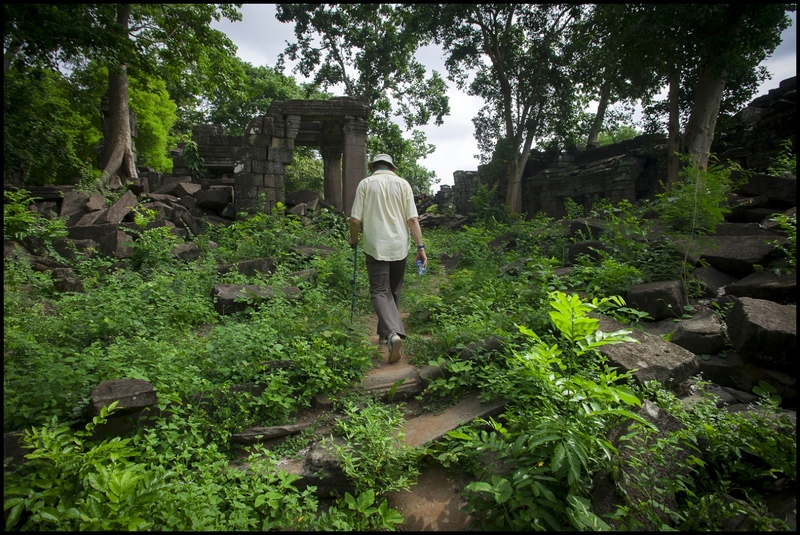 Carrying the fallen stones into the 3D scanning area at Banteay Chhmar Temple in Cambodia. Built by Khmer King Jayavarman 7th (1181-1219). 28 year old Information Technology operator Sin Loueth gets to work 3D scanning the collapsed bas relief at Banteay Chhmar. The temple was built by Khmer King Jayavarman 7th (1181-1219). Bumping along a dusty pot holed track in north western Cambodia my driver remarks: "This is only the second time in 15 years that I have been asked to go to Banteay Chhmar and the last time was 10 years ago!" Having long left the tarmac road from Siem Reap and turned on to what is rather optimistically called Highway 56, we pass the regional capital of Sisophon. With the road deteriorating rapidly we start to play an auto version of dare as trucks, tractors, motorbikes and bullocks are courageously passed or challenged head on. Demanding enough in the dry season the journey along this highway often becomes impossible when the monsoons break. It was closed to all traffic for 6 weeks in 2011 as what constitutes the road was simply washed away. 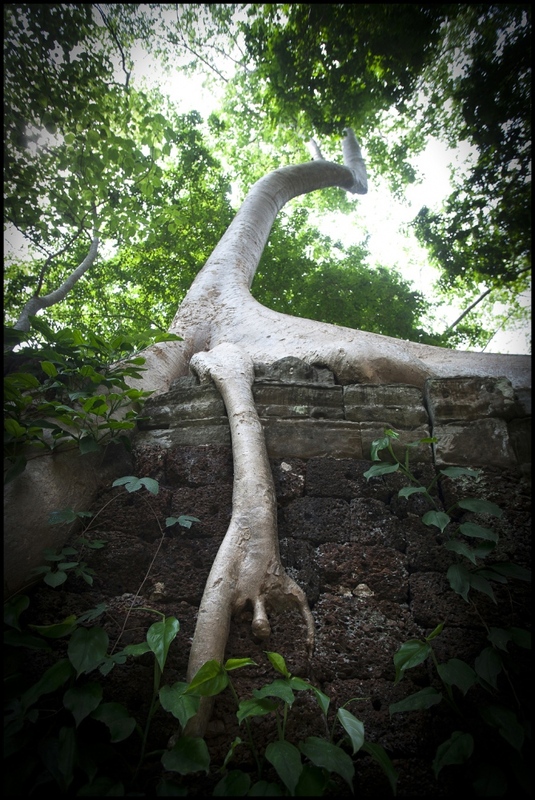 Our destination is the crumbling Khmer Monastic Temple complex of Banteay Chhmar with its collapsed shrines, engraved walls and massive 'Spong' tree roots protruding from its stonework. It is situated in splendid geographical isolation only 12 straight kilometres from the Thai border but 4 or 5 suspension-wrecking hours by car from the closest city, Siem Reap. While an estimated 7000 tourists a day descended on Angkor in 2011 barely a trickle of 700 a year make the challenging journey to Banteay Chhmar. A long overdue new tarmac road is expected to be completed in 2013, which might just bring the 800 year isolation of this temple to an end. Banteay Chhmar, meaning 'The citadel of the Cats' in Khmer, was built by the Khmer King Jayavarman VII (AD 1181-1219) at the height of the Angkorian Empire in the 12th century. Better-known temple complexes can be visited at the UNESCO World Heritage Site of Angkor. However, it is Banteay Chhmar, which remains still quietly hidden and now stands as one of the last great-untouched Angkorian Temples. Forsaken for centuries after the collapse of the Khmer empire it was left to the ravishes of time, monsoon seasons and the advancing jungle to inflict their worst. In more recent history the Khmer Rouge - coming to power in Cambodia in 1975, holding their genocidal regime for nearly four years and being eventually ousted by military invasion from its neighbour Vietnam - retreated to encampments on both sides of the Thai border and made Banteay Chhmar one of its last strongholds until its eventual defeat and political assimilation after the death of its leader Pol Pot in 1998. Still, it was not until as recently as 2007 that land mines from the civil war years laid in the surrounding countryside and the temple itself were fully removed and the area became relatively safe to visit again. 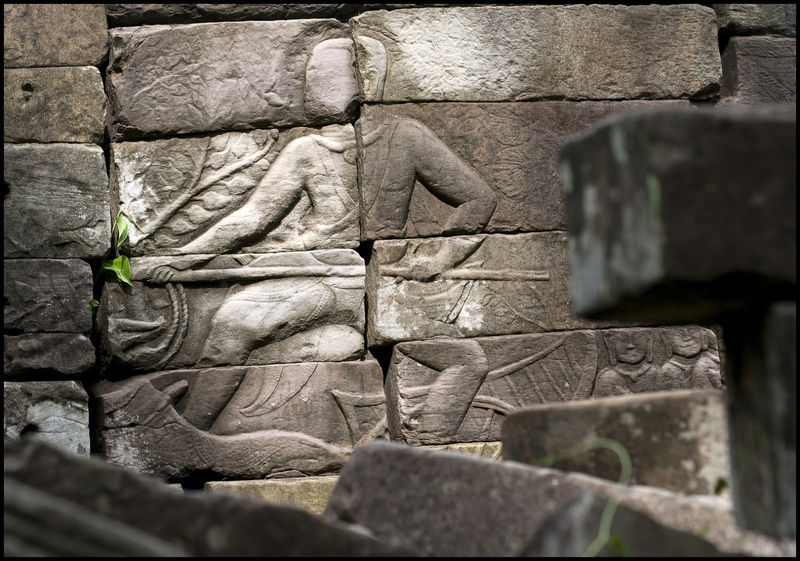 The temple complex of Banteay Chhmar and its artefacts have long been objects of desire to plunderers, the most rampant looting taking place during the 1990's. 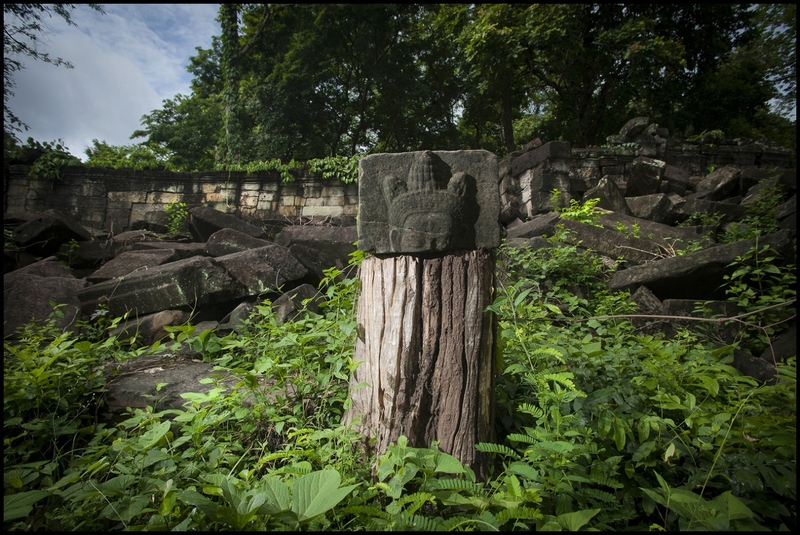 Besides hundreds of sculptures, four out of a set of eight stonewall engravings depicting Avaloketesvarus (embodying the compassion of all Buddhas), a feature unique to Banteay Chhmar, were stolen. The sections were simply jack hammered off and trucked across the Thai border for sale. Sébastien Cavalier, UNESCO representative in Cambodia at the time, prompted to comment on security problems at the site put it in a nutshell: "At Angkor the head disappears. 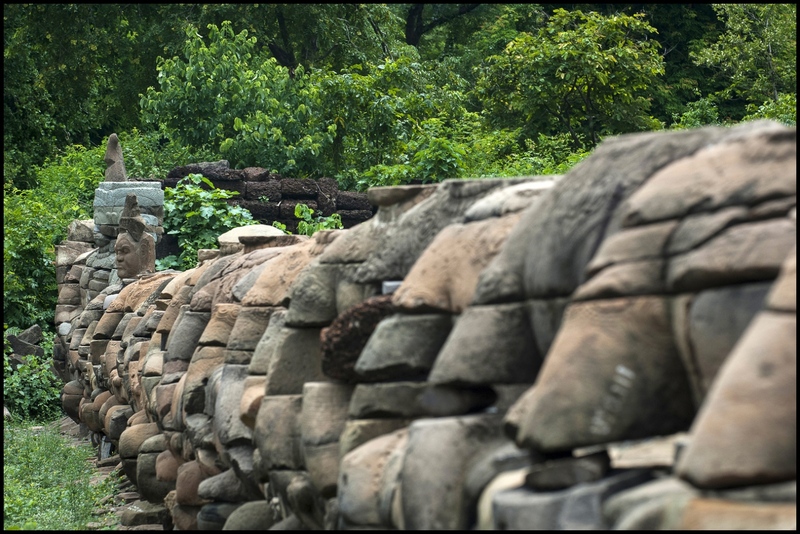 At Banteay Chhmar the whole wall disappears." Two of the looted panels were intercepted and are now kept in The National Museum in the capital Phnon Penh -it is hoped that one day they will be returned to Banteay Chhmar. The Global Heritage Fund (GHF) now manages the preservation of the site, a Californian based foundation established in 2002, with an European Arm of operations that opened as a registered charity in London in 2006. It was asked to collaborate with overseeing the preservation of the temple complex by the Cambodian Ministry of Culture and Fine Arts in 2008. Beside the actual conservation programme, GHF emphasises the training of local people to form a skilled team, able to maintain and manage the site. Its vision for Banteay Chhmar is "to save one of the last great Angkorian Temples in Cambodia that remains unstudied, unconserved and unprotected and in so doing hand back to the Cambodian people their heritage in a properly conserved state". 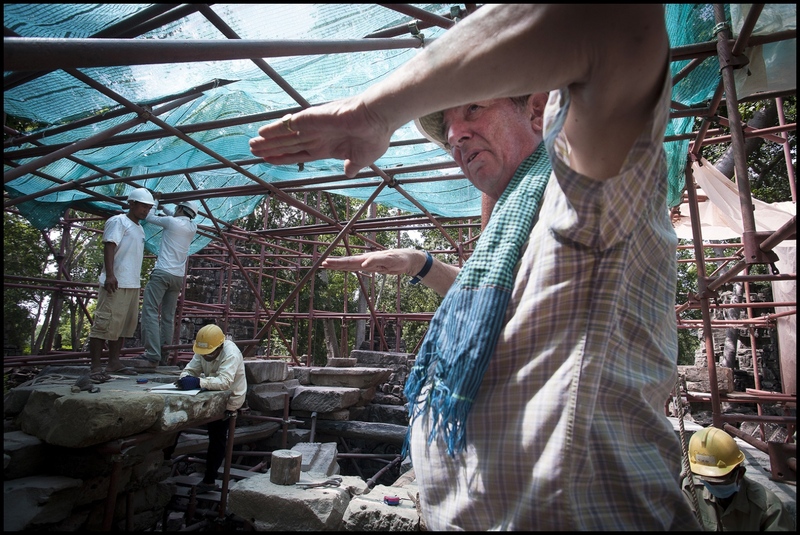 British Architect John Sanday (OBE) is GHF's Regional Director for Asia and Project Manager at Banteay Chhmar. He is not a man to be trifled with. Sanday, frank in his views but still reserved in his manner, holds a wealth of experience particularly in repairing and conserving historic Asian architectural monuments. Standing at the southern entrance, a causeway over the lotus choked moat which encircles the monastic complex, guarded by mostly headless statues of demons and gods, he comments: "Most tourists have a dream of visiting Cambodia and walking alone around an ancient historic city in the middle of the jungle. We hope we will be able to keep some of that romance alive here at Banteay Chhmar." In his 60's, he still nimbly weaves his way through and over the piles of fallen stones while sharing his vision for the site: "I would like to preserve it as a partial ruin with low-impact and safe visitor access via suspended cable platforms over the fallen structures". Passing a fallen shrine to our left, he recounts its specific gruesome history: "Looters thought precious stones could be found inside. They are still in there - the temple collapsed on them. No survivors and no way of getting the bodies out at the time, so they were simply left. Some of the locals believe the looters spirits still haunt these grounds!" In front of us a ghostly light of a different kind appears. Using a simple block and tackle, Khmer workers man-handle a single sandstone block, weighing probably half a ton, into a light tight tent. Here is the projects laser scanning area. 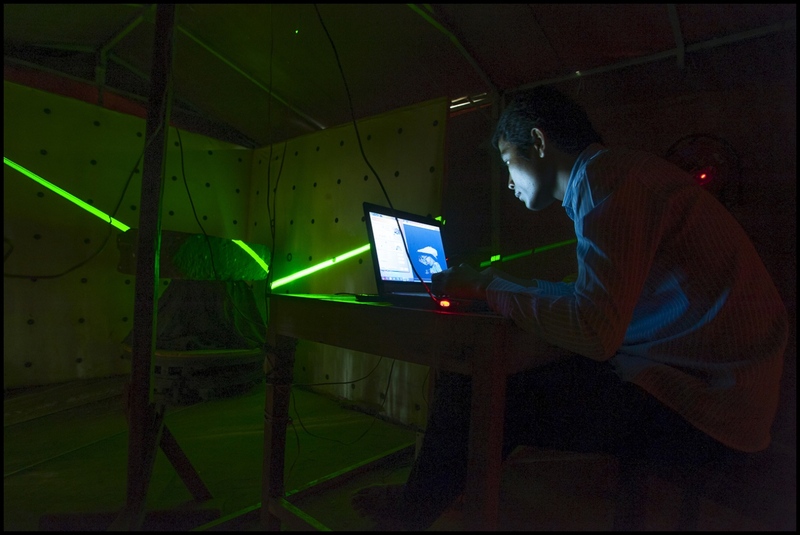 Once the stone blocks are safely inside, an intense green laser beam runs over their surface from all possible angles. State of the art 3D digital camera technology is used to scan the fallen temple stones, and then the minute measurements are entered into a database. 28-year-old Information Technology operator Sin Loueth undertakes the cataloguing of stone blocks from a Face Tower, which had been carefully dismantled following damage caused during a recent storm with some tenacity. With an average of 9 stones a day fully scanned the work is a labour of love and, if the research is successful, is set to continue well into the future. The Interdisciplinary Centre provided the technology as well as the training of the all-Khmer crew for Science Computing at the University of Heidelberg in Germany. Here, a team of specialist’s works hard on a computer programme that can use this data to accurately reassemble all the stones in a 3D model that shows how the temple tower once stood. 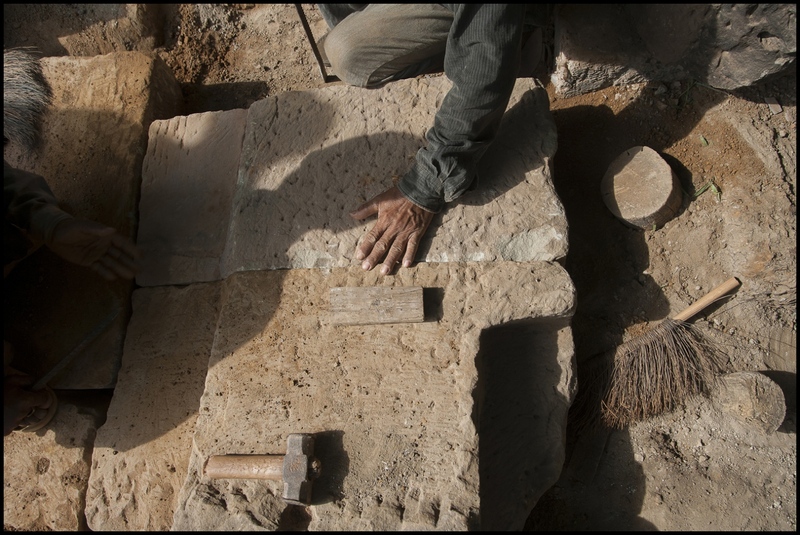 It is hoped that one day putting the stones into their correct location can be as simple as the 'click of a button', a process described in Heidelberg with respectful reference to Sanday as 'solving Johns Puzzle'. 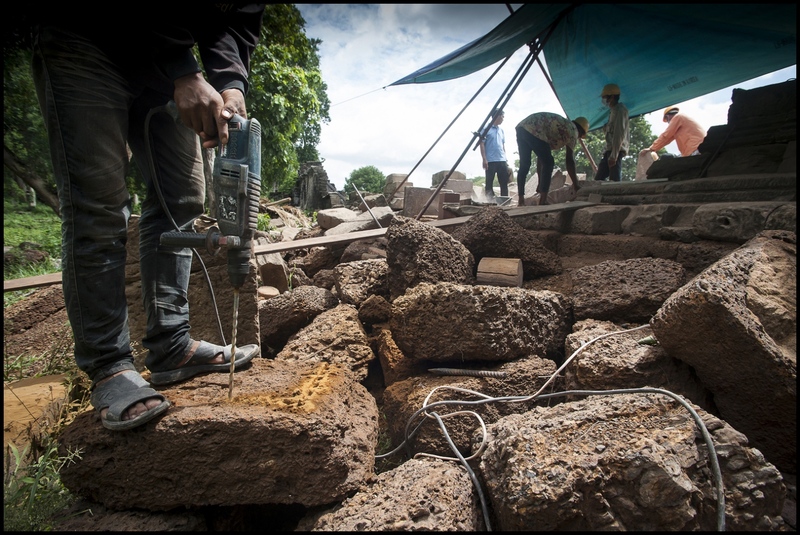 Over at the eastern enclosure gallery a crew of Khmer stone masons is continuing with the work of rebuilding a 50metre section of the wall they have carefully been dismantling and restoring for the last 3 years. They have erected some tarpaulin cover to protect themselves from the burning sunlight. 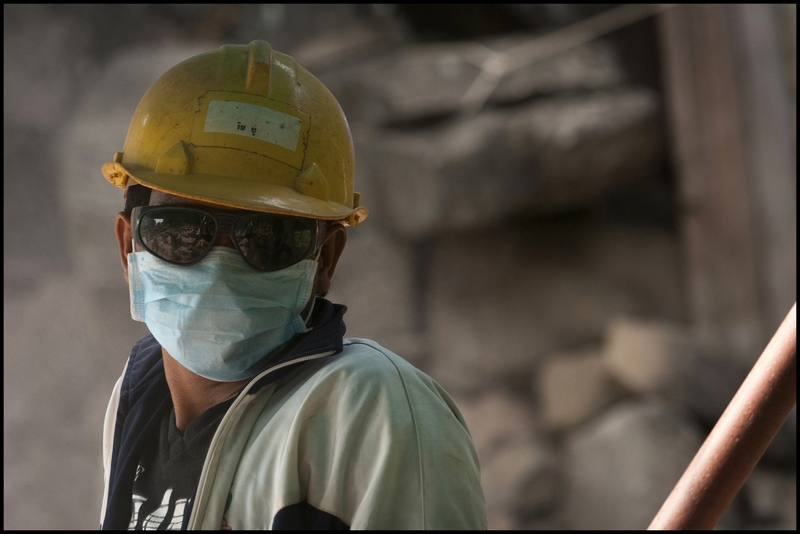 Fans are being used to bring some comfort to the work in the blistering temperatures and disperse the dust created by their constant chiselling. Deputy Director of the Department for Safeguarding and Preservation of Monuments, 41 year old Lim Sothin, explains for my benefit what they are doing: "Restoring this gallery of bas-reliefs is very important for the community in Banteay Chhmar. There are only three temples in Cambodia that have these types of reliefs: Ankor Wat, Bayon and Banteay Chhmar, while the Avalokiteshvara can not be found at any other temple, its unique to this site!" Working alongside is 68-year-old Mok Ngam, employed as a Senior Consultant at the site. He has been working with Sanday for over 14 years. Originally apprenticed as a stonemason under the French during the 1960's, he soon had to abandon his way of life and even deny its existence. With the Khmer Rouge gaining power in Cambodia Ngham moved with his wife and two children to another district some 30 kilometres away from where he had been working. "The reason I survived the Pol Pot era is that I moved. No one knew me. I said I was a simple peasant". And after a pause he adds: "It was a terrible time, you never knew if you were going to live one day to the next and there was constant hunger. I learned not to hope for anything." Ngam lost both his parents, his older sister and brother in law to the Pol Pot regime. His son was injured in 1980 by a land mine explosion losing an arm and a leg. It is estimated that Cambodia under the Khmer Rouge's reign of terror lost about 2 million citizens out of a total of 7 million to starvation, decease and summary execution. A whole tier of the population, that was educated, spoke a foreign language or was otherwise skilled, were removed in the quest to return to 'Year Zero' as it became infamously known. Even the wearing of reading glasses was deemed to be enough of a sign of intellect to warrant suspicions and assassination. 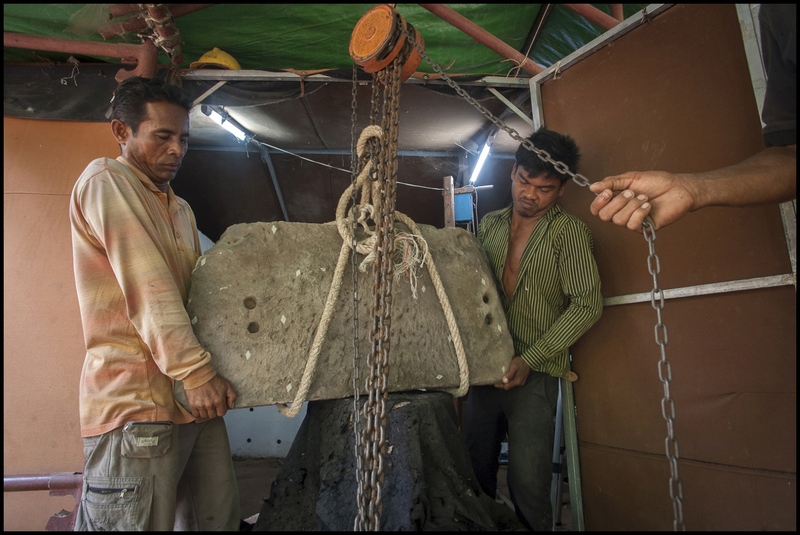 "I never thought I would be able to work with stone again", Ngham confides, "and to be in the position to train young Cambodians and pass on my skills." Finishing his sentence and politely wishing me farewell with a traditional bow he turns to resume his work with his crew, gently laying a stone block back into its correct position within the ancient temple walls. Sanday picks up the conversation with news that he must now leave and attend some meetings with government officials in Siem Reap. 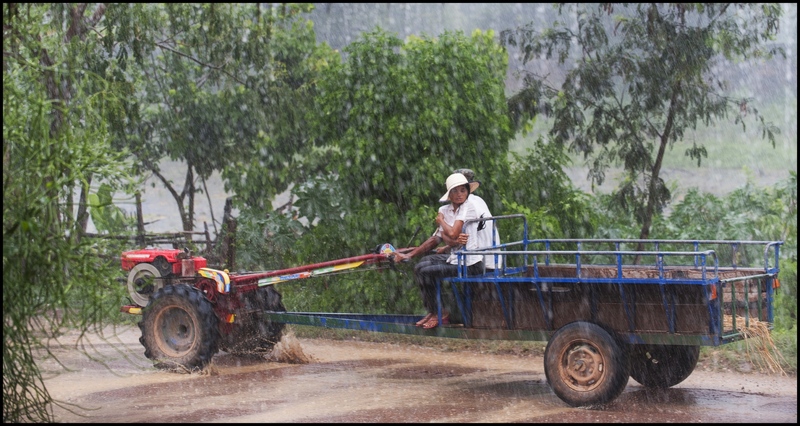 He will return regularly to Cambodia to oversee the site along with many of his other duties every couple of months. "I am proud of these guys working here" he states referring to his all Khmer workforce. "I trained them up and now they can manage themselves, they know what they are doing." Community Based Tourism representative Sophal Tath and his colleague Sopheng Khlout offer to take me to see some of the satellite temples which make up Banteay Chhmar. We head out on motorbike following single-track paths into the jungle. 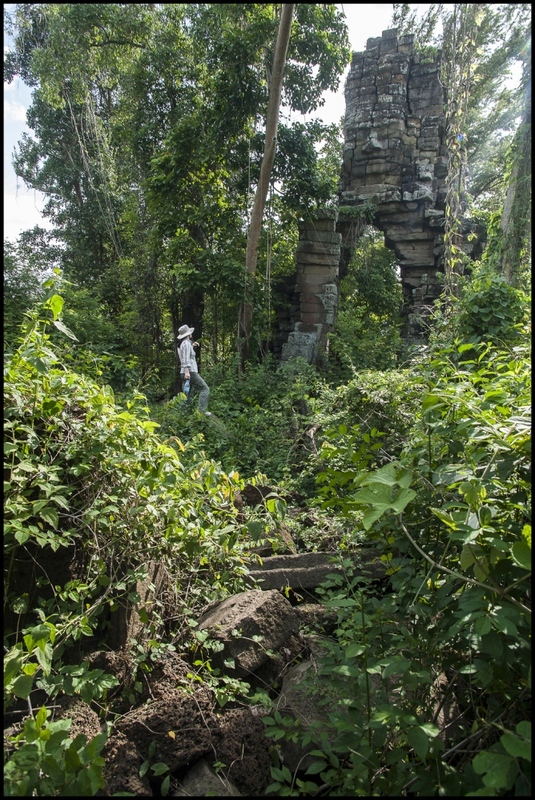 The outlying temples are signposted from the road but there is no way of finding them through the thick undergrowth without local guides help. Soon the motorbikes are abandoned and we progress on foot. Pushing back the vegetation we make our way over a dilapidated bridge. With only a quarter of its length crossed it is decided that its probably safer to descend to the ground and progress our way through the stream rather than trust the rotted wooden planks any further. On the skyline a serene face tower materialises and stares down at us as we approach Ta Nem Temple. As the light starts to fall, Sophal explains some hard facts of life to me: "We need 5000 people every year to visit and stay with our community [CBT offers home stays with Khmers, there are no hotels or guest houses in Banteay Chhmar] to break even and run our project without outside funds. 10,000 people would be better. The community knows how important the temple is to us and our future livelihood." The CBT policy is to facilitate sustainable tourism for the site. This community centred approach is the key to the visitors they envisage coming to Banteay Chhmar: staying with Khmer families, working and eating with them in what is still largely an agrarian way of life, like in most of Cambodia, with the temple at its spiritual heart. It is also considered 'best practice' by GHF that the benefits of the site should become self evident to those who live there, because only then will they naturally become drawn into the preservation of the temple themselves and return to being its rightful guardians. For as Sanday says "It is the local people that will ultimately ensure the temples future and preservation."